Leave it to the Crowdfunding opposition to turn ‘entrepreneurship, innovation and jobs’ into ‘fear, fraud and apocalypse.’ Now that the JOBS Act is on the verge of passing, the media is running wild with stories that re-regulating the markets (yes Crowdfund Investing (aka equity-based crowdfunding) is re-regulating not deregulating) will lead to mass fraud, hysteria, a loss in investor confidence and a collapse of the general markets. Most importantly there’s a general misperception among the opponents to Crowdfund Investing that access to capital will NOT lead to innovation and jobs. How wrong they are. Over a year ago, 3 successful entrepreneurs sat down with a goal to craft a framework to allow a limited amount of seed and growth capital to flow into the hands of entrepreneurs using the tenants of crowdfunding. These entrepreneurs had the experience of taking ideas, raising money, growing businesses and hiring over 150 employees. That’s walking the walk. These MBA grads understand what it means to be an entrepreneur, what information investors need to make informed decisions, what the laws regarding raising capital formation are and the benefits of a symbiotic relationship to a functioning, transparent marketplace. The missing component post the 2008 financial meltdown was the disappearance of capital. Along with the collapse of the financial markets went home equity lines used to launch ideas, credit cards with large credit lines and low interest rates used to finance growth, and private money used to expand businesses. Business 101 – Cash is KING. Without access to capital, you cannot grow or hire! So rather than come up with “a mechanism to undermine market transparency, roll back important investor protections, and, drive up the cost of capital for small companies” as Barbara Roper Director of Investor Protection, Consumer Federation of America said, these Entrepreneurs crafted a framework that if implemented along its original extent would have addressed all the concerns, misperceptions and drama floating around today. The framework was carefully crafted. It carved out a rule under which fraud-free entrepreneurs and small businesses with revenues of less than $5M that weren’t foreign corps, public or investment companies could raise up to $1M either selling Common Stock or revenue based financing on SEC-registered websites. Where, investors would have to agree using current standard verification technology that they understand there is no guarantee of return, that they could lose their entire investment and that their liquidity/return is limited to any dividends, sale, public offering or a merger of the company. And once they agreed to that, would be limited as to how much they could risk to the lower of $10,000 or 10% of their AGI. Where standardized forms (generic term sheets & subscription agreements) based on industry best practices would be used to maintain transparency and reduce time and expense for all parties. Post funding standardized and automated reporting for use of proceeds would be required on a quarterly basis by entrepreneurs. Platforms would provide the SEC monthly offering reports that include information on: deals funded, entrepreneurs’ names, social security numbers, addresses, date of births, amount of capital raised, list of investors and individual dollar amount contributed. And most importantly social media would control the process. Entrepreneurs would only be allowed to solicit people in their social network using Facebook, Twitter, Linkedin, etc. Platforms would use social media tools to create a deal room for each idea where interested investors can publicly pick apart the entrepreneur, the idea, the business model and the investment opportunity. And most importantly, NO MONEY would be exchanged until the ENTIRE crowd decided to fund the entrepreneur and the entrepreneur’s funding target was 100% met. Not so easy, right? If implemented as designed it would allay all concerns including entrepreneurs who need capital, investors who need proper disclosures to make informed decisions, regulators who want to know what is happening in the capital markets and intermediaries who will provide the social media tools to allow for solicitation and vetting before the crowd collectively and in an open dialog, decides which of their community entrepreneurs they wish to fund and with how much money as well as the conduit for the transaction to happen. Crowdfund Investing will be a great financing tool for our nation’s entrepreneurs. The opponents, well they are academic and regulators. We are entrepreneurs , investors and most importantly JOB CREATORS. We created 150 jobs before when capital was available. But you know what? We can’t do it today, without Capital! The time is now to Legalize Crowdfunding!! On Tuesday, March 20th the Senate will take up the House-approved JOBS Act. It includes the majority of the Crowdfunding framework that we originally brought to DC, was used by Representative McHenry (R-NC) as the basis for HR2930, and was endorsed by the President. Several components of the framework were also included in the Senate version and many of our ideas are the ones used in the bipartisan Merkley/Bennet/Brown/Landrieu compromise that was offered as an amendment to the Crowdfunding portion of the House-approved Bill. Everyone is in agreement. Solving the funding problem faced by our nation’s job creators is a smart thing. Crowdfund Investing (CFI) is a great idea but it has to take place in a marketplace that is transparent and accountable. However, without a Senate passed bill, Crowdfund Investing won’t exist. Rally your supporter, followers, friends and family to do the same thing. Tweet, Facebook post, Linkedin update, etc about this! The opponents to Crowdfunding are outnumbering proponents in calls to the Senate. If Crowdfunding fails here, it dies and history proves that its chances of being resurrected again are near zero. Here’s a tweet you can use: 2 Directions #Crowdfunding can go in Tuesday’s Senate Vote & What You Need to Do http://wp.me/p1JYwD-48 PLEASE RETWEET! #JOBSAct. 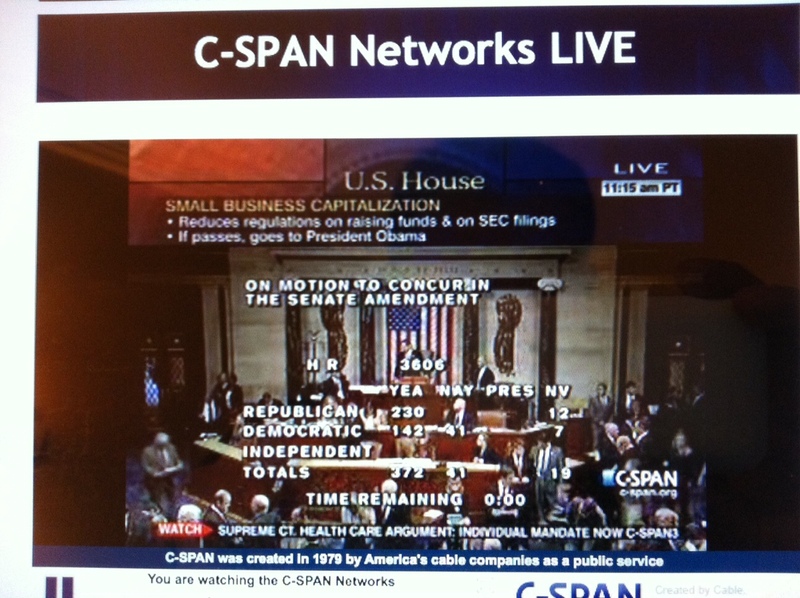 It is CRITICAL THAT THE SENATE VOTE IN FAVOR OF THE PRESIDENT, JOBS AND CROWDFUNDING! If the Senate votes against the JOBS Act, Crowdfunding will probably never see the light of day! It is important that if you support Crowdfunding you have your voice heard Tuesday! We are back in Washington, DC and working tirelessly to see this through!